Want to make a lasting impression while enjoying the comforts of an SUV. It doesn’t get more old-school than this. 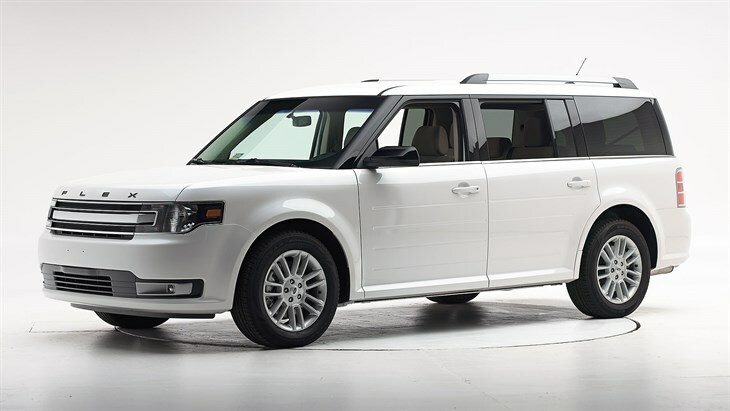 Ford Flex is the only car in the market which combines comfort with the looks of an old fashioned station wagon. This deviation from the plethora of modern SUV wannabes is quite appreciable. The Flex isn’t a slouch either in terms of performance. Carrying a 3.5 liter V6 engine, it churns out 287 horsepower. The higher model also has a turbocharged EcoBoost V6 which delivers 365 horse powers. The engine is coupled to a six-speed automatic transmission in both two wheel and four wheel drive format. Such engine specifications make this old school wagon not only an eye candy but also a performance beast. Flex is surprisingly quite a comfortable car when compared to its competitors. It’s easy to get in and get outof the vehicle. The seats are quite plush as well. Although the Flex has 20 cubic feet less boot space than the Honda Pilot, both its rear seats can be folded to increase luggage space when required. Flex also has a plethora of equipment. The refrigerator console in the upper variants of the car is quite unique and is not available for any other vehicle in this category. The only con that I can think of is the average fuel economy. With a highway fuel economy of 25 mpg, it’s quite average in this segment. Apart from this, the high curb weight of the car tends to cause a bit of body roll at times. Overall Flex is an excellent option for people who want to make an impression while shuffling your kids around. It receives a solid 4 star out of 5. The only major con was the fuel economy which is average.